Be sure to check out our blogs right here! And don't be shy, comment! Are you on Facebook? If so, be sure to check us out here and click “Like”! It’s another great way to stay current and up to date on things that are happening within the club. Live on the coast? Check out the Cape Fear Area Facebook page here! Have some PICTURES you want to share? Upload them here! We will periodically review uploaded photos and add promising ones to the website! For a how-to on uploading pictures, click here. 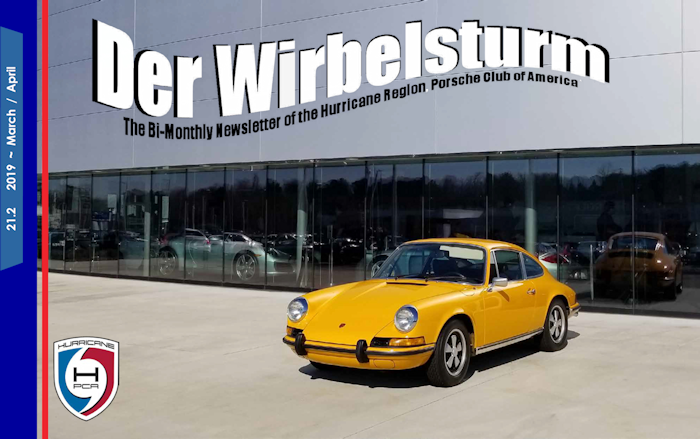 Be sure to check out the very latest version of our award winning Club newsletter, der Wirbelsturm, which is posted here for the latest news, events and stories from the Region! As always, our Editor Darrell Bryant greatly appreciates any contribution of a story, tech article or tale (or folklore) related to Porsche ownership for the newsletter. Please consider stepping up with an article for the next issue! You may now order your name badge in the online store! Simply click on "STORE" in the menu bar, then select "Name Badge" (you will be prompted to register if you have not done so in the past). If this is your first name badge, it is free (INCLUDING SHIPPING)! If this is a replacement, then the cost is $8.50 and it will be shipped to you. In order to access the Goodie Store, you will need to register. Please click "LOGIN|REGISTER" in the navigation menu and provide your first and last names (as they appear on your PCA member card), and you email address (associated with your PCA membership). After your membership has been verified, you will receive a notification via email that your registration is complete and you will be able to access the goodie store.